"Taro" redirects here. For other uses, see Taro (disambiguation). Not to be confused with tarot. Colocasia esculenta is a tropical plant grown primarily for its edible corms, the root vegetables most commonly known as taro ( /ˈtɑːroʊ, ˈtæroʊ/). It is the most widely cultivated species of several plants in the Araceae family which are used as vegetables for their corms, leaves, and petioles. 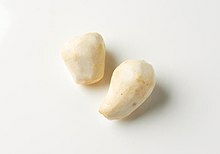 Taro corms are a food staple in African, Oceanic and South Asian cultures, and taro is believed to have been one of the earliest cultivated plants. This plant and its root is generally called taro, but it has different names in different countries like for instance eddoe or malanga. The plant is called tales in Java, oah in Hokkien,cocoyam in Ghana, taro in Tahiti, ndalo in Fiji, talo in Samoa, gabi in the Philippines, colcas ( قلقاس) in Arabic, kolokasi or kolokas in Cyprus, kalo in Hawaii and amateke in Rwanda. :23 Taro is often referred to as "elephant ears" when grown as an ornamental plant. Linnaeus originally described two species, Colocasia esculenta and Colocasia antiquorum, but many later botanists consider them both to be members of a single, very variable species, the correct name for which is Colocasia esculenta. The specific epithet, esculenta, means "edible" in Latin. Taro is related to Xanthosoma and Caladium, plants commonly grown ornamentally, and like them it is sometimes loosely called elephant ear. Similar taro varieties include giant taro ( Alocasia macrorrhizos), swamp taro ( Cyrtosperma merkusii), and arrowleaf elephant's ear ( Xanthosoma sagittifolium). Colocasia esculenta is a perennial, tropical plant primarily grown as a root vegetable for its edible, starchy corm. The plant has rhizomes of different shapes and sizes. Leaves are up to 40 cm × 24.8 cm (15.7 in × 9.8 in) and sprout from the rhizome. They are dark green above and light green beneath. They are triangular-ovate, sub-rounded and mucronate at the apex, with the tip of the basal lobes rounded or sub-rounded. The petiole is 0.8–1.2 m (2.6–3.9 ft) high. The path can be up to 25 cm (9.8 in) long. The spadix is about three fifths as long as the spathe, with flowering parts up to 8 mm (0.31 in) in diameter. The female portion is at the fertile ovaries intermixed with sterile white ones. Neuters grow above the females, and are rhomboid or irregular orium lobed, with six or eight cells. The appendage is shorter than the male portion. Colocasia esculenta is thought to be native to Southern India and Southeast Asia, but is widely naturalised. Colocasia is thought to have originated in the Indomalaya ecozone, perhaps in East India, Nepal, and Bangladesh. It spread by cultivation eastward into Southeast Asia, East Asia and the Pacific Islands; westward to Egypt and the eastern Mediterranean Basin; and then southward and westward from there into East Africa and West Africa, where it spread to the Caribbean and Americas. Taro was probably first native to the lowland wetlands of Malaysia, where it is called taloes. In Australia, Colocasia esculenta var. aquatilis is native to the Kimberley region of Western Australia; variety esculenta is naturalised in Western Australia, the Northern Territory, Queensland and New South Wales. In Turkey, Colocasia esculenta is locally known as gölevez and mainly grown on the Mediterranean coast, such as the Alanya district of Antalya Province and the Anamur district of Mersin Province. In the southeastern United States, this plant is recognized as an invasive species. Many populations can be commonly found growing near drain ditches and bayous in Houston, Texas. At around 3.3 million metric tons per year, Nigeria is the largest producer of taro in the world. Taro can be grown in paddy fields where water is abundant or in upland situations where water is supplied by rainfall or supplemental irrigation. Taro is one of the few crops (along with rice and lotus) that can be grown under flooded conditions. This is due to air spaces in the petiole, which permit underwater gaseous exchange with the atmosphere. For a maximum dissolved oxygen supply, the water should be cool and flowing. Warm, stagnant water causes basal rotting. For maximum yields, the water level should be controlled so that the base of the plant is always under water. Flooded cultivation has some advantages over dry-land cultivation: higher yields (about double), out-of-season production (which may result in higher prices), and weed control (which flooding facilitates). On the other hand, in flooded production systems taro requires a longer maturation period, investment in infrastructure, and higher operational costs, and monoculture is likely. Like most root crops, taro and eddoes do well in deep, moist or even swampy soils where the annual rainfall exceeds 2,500 mm (98 in). Eddoes are more resistant to drought and cold. The crop attains maturity within six to twelve months after planting in dry-land cultivation and after twelve to fifteen months in wetland cultivation. The crop is harvested when the plant height decreases and the leaves turn yellow. These signals are usually less distinct in flooded taro cultivation. People usually consume its edible corm and leaves. The corms, which have a light purple color due to phenolic pigments,  are roasted, baked or boiled. The natural sugars give a sweet, nutty flavor. The starch is easily digestible, and since the grains are fine and small it is often used for baby food. Young taro leaves and stems can be eaten after boiling twice to remove the acrid flavor. The leaves are a good source of vitamins A and C and contain more protein than the corms. In its raw form, the plant is toxic due to the presence of calcium oxalate,   and the presence of needle-shaped raphides in the plant cells. However, the toxin can be minimized and the tuber rendered palatable by cooking,  or by steeping in cold water overnight. Corms of the small, round variety are peeled and boiled, then sold either frozen, bagged in its own liquids, or canned. Taro (dalo in Fijian) has been a staple of the Fijian diet for centuries, and its cultural importance is celebrated on Taro Day. Its growth as an export crop began in 1993 when taro leaf blight  decimated the taro industry in neighboring Samoa. Fiji filled the void and was soon supplying taro internationally. Almost 80% of Fiji's exported taro comes from the island of Taveuni where the taro beetle species Papuana uninodis is absent. The Fijian taro industry on the main islands of Viti Levu and Vanua Levu faces constant damage from the beetles. The Fiji Ministry of Agriculture and the Land Resources Division of the Secretariat of the Pacific Community (SPC) are researching pest control and instigating quarantine restrictions to prevent the spread of the pest. Taveuni now exports pest-damage-free crops. Kalo is the Hawaiian name for the taro plant. The local crop plays an important role in Hawaiian culture, mythology, and cuisine. Kalo is a traditional staple of the native cuisine of Hawaii. Some of the uses for taro include poi, table taro (steamed and served like a potato), taro chips, and luau leaf (to make laulau)). In Hawaii, kalo is farmed under either dryland or wetland conditions. Taro farming in the Hawaiian Islands is challenging because of the difficulties of accessing fresh water. Kalo is usually grown in "pond fields" known as loʻi. Typical dryland or "upland" varieties (varieties grown in watered but not flooded fields) in Hawaii are lehua maoli and bun long, the latter widely known as "Chinese taro". Bun long is used for making taro chips. Dasheen (also called "eddo") is another dryland variety of C. esculenta grown for its edible corms or as an ornamental plant. A contemporary Hawaiian diet consists of many tuberous plants, particularly sweet potato and kalo. By ancient Hawaiian custom, fighting is not allowed when a bowl of poi is "open". Similarly, it is also considered disrespectful to fight in front of an elder and one should not raise their voice, speak angrily, or make rude comments or gestures. Several small loʻi (pondfields) in which kalo (taro) is being grown in the Maunawili Valley on Oʻahu, Hawaiʻi. The ditch on the left in the picture is called an ʻauwai and supplies diverted stream water to the loʻi. A loʻi is a patch of wetland dedicated to growing kalo (taro). Hawaiians have traditionally used water irrigation systems to produce kalo. Wetland fields produce ten to fifteen times more kalo per acre than dry fields. Wetland-grown kalo need a constant flow of water, and to get this water, fields are usually positioned between the mauka (mountains) and makai (sea). A lo'i specifically denotes wetland kalo growing, not dry land. When kalo was brought to Hawaiʻi, there were about 300 varieties (about 100 remain). The kalo plant takes seven months to grow until harvest, so lo`i fields are used in rotation and the soil can be replenished while the loʻi in use has sufficient water. The stems are typically replanted in the lo`i for future kalo harvests. Once harvested, kalo is incorporated into many foods. The leaves are used to make laulau, from the corm poi or paʻiʻai. The Taro corm is a traditional staple crop for large parts of Papua New Guinea, with a domestic trade extending its consumption to areas where it is not traditionally grown. Taro from some regions has developed particularly good reputations with (for instance) Lae taro being highly prized. Considered the staple starch of traditional Polynesian cuisine, taro is both a common and prestigious food item that was first introduced to the Polynesian islands by prehistoric seafarers of Southeast Asian derivation. The tuber itself is prepared in various ways, including baking, steaming in earth ovens (umu or imu), boiling, and frying. The famous Hawaiian staple poi is made by mashing steamed taro roots with water. Taro also features in traditional desserts such as Samoan fa'ausi, which consists of grated, cooked taro mixed with coconut milk and brown sugar. The leaves of the taro plant also feature prominently in Polynesian cooking, especially as edible wrappings for dishes such as Hawaiian laulau, Fijian and Samoan palusami (wrapped around onions and coconut milk), and Tongan lupulu (wrapped corned beef). Ceremonial presentations on occasion of chiefly rites or communal events (weddings, funerals, etc.) traditionally included the ritual presentation of raw and cooked taro roots/plants. The Hawaiian laulau traditionally contains pork, fish, and lu'au (cooked taro leaf). The wrapping is inedible ti leaves (Hawaiian: lau ki). Cooked taro leaf has the consistency of cooked spinach and is therefore unsuitable for use as a wrapping. In Samoa, the baby talo leaves and coconut milk are wrapped into parcels and cooked, along with other food, in an earth oven . The parcels are called palusami or lu'au. The resulting taste is smoky, sweet, savory and has a unique creamy texture. The root is also baked (Talo tao) in the umu or boiled with coconut cream (Faálifu Talo). It has a slightly bland and starchy flavor. It is sometimes called the Polynesian potato. Taro ( simplified Chinese: 芋头; traditional Chinese: 芋頭; pinyin: yùtou; Cantonese Yale: wuhtáu) is commonly used as a main course as steamed taro with or without sugar, as a substitute for other cereals, in Chinese cuisine in a variety of styles and provinces steamed, boiled or stir-fried as a main dish and as a flavor-enhancing ingredient. In Northern China, it is often boiled or steamed then peeled and eaten with or without sugar much like a potato. It is commonly braised with pork or beef. It is used in the dim sum cuisine of southern China to make a small plated dish called taro dumpling as well as a pan-fried dish called taro cake. It can also be shredded into long strips which are woven together to form a seafood birdsnest. Taro cake is a delicacy traditionally eaten during Chinese New Year celebrations. As a dessert, it can be mashed into a purée or used as a flavoring in tong sui, ice cream, and other desserts such as Sweet Taro Pie. McDonald's sells taro-flavored pies in China. Taro is mashed in the dessert known as taro purée. In Korea, taro is called toran ( Korean: 토란: "earth egg"), and the corm is stewed and the leaf stem is stir-fried. 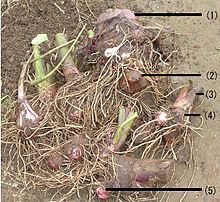 Taro roots can be used for medicinal purposes, particularly for treating insect bites. It is made into the Korean traditional soup toranguk (토란국). Taro stems are often used as an ingredient in yukgaejang (육개장). In the Philippines taro is usually called gabi, abi or avi and is widely available throughout the archipelago. Its adaptability to marshland and swamps make it one of the most common vegetables in the Philippines. The leaves, stems, and corms are all consumed and form part of the local cuisine. A popular recipe for taro is laing; the dish's main ingredients are taro leaves (at times including stems) cooked in coconut milk, and salted with fermented shrimp or fish bagoong. It is sometimes heavily spiced with red hot chilies called siling labuyo. Another dish in which taro is commonly used is the Philippine national stew, sinigang, although radish can be used if taro is not available. This stew is made with pork and beef, shrimp, or fish, a souring agent (tamarind fruit, kamias, etc.) with the addition of peeled and diced corms as thickener. The corm is also prepared as a basic ingredient for ginataan, a coconut milk and taro dessert. In Taiwan, taro— yùtóu (芋頭) in Mandarin, and ō͘-á (芋仔) in Taiwanese—is well-adapted to Taiwanese climate and can grow almost anywhere in the country with minimal maintenance. Before the Taiwan Miracle made rice affordable to everyone, taro was one of the main staples in Taiwan. Nowadays taro is used more often in desserts. Supermarket varieties range from about the size and shape of a brussels sprout to longer, larger varieties the size of a football. Taro chips are often used as a potato-chip-like snack. Compared to potato chips, taro chips are harder and have a nuttier flavor. Another popular traditional Taiwanese snack is taro ball, served on ice or deep-fried. It is common to see taro as a flavor in desserts and drinks, such as bubble tea. In Vietnam, there is a large variety of taro plants. One is called khoai môn, which is used as a filling in spring rolls, cakes, puddings and sweet soup desserts, smoothies and other desserts. Taro is used in the Tết dessert chè khoai môn, which is sticky rice pudding with taro roots. 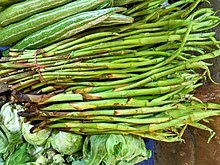 The stems are also used in soups such as canh chua. One is called khoai sọ, which is smaller in size and more delicious than Khoai môn, and of course, more expensive than khoai môn. Another common taro plant grows roots in shallow waters and grows stems and leaves above the surface of the water. This taro plant has saponin-like substances that cause a hot, itchy feeling in the mouth and throat. Northern farmers used to plant them to cook the stems and leaves to feed their hogs. They re-grew quickly from their roots. After cooking, the saponin in the soup of taro stems and leaves is reduced to a level the hogs can eat. Today this practice is no longer popular in Vietnam agriculture. These taro plants are commonly called khoai ngứa, which literally means "itchy potato". In Bangladesh taro is a very popular vegetable known as kochu (কচু) or mukhi (মুখি). Within the Sylheti dialect of the Bangla language, it is called mukhi. It is usually cooked with small prawns or the ilish fish into a curry, but some dishes are cooked with dried fish. Its green leaves, kochu pata (কচু পাতা), and stem, kochu (কচু), are also eaten as a favorite dish and usually ground to a paste or finely chopped to make shak — but it must be boiled well beforehand. Taro stolons or stems, kochur loti (কচুর লতি), are also favored by Bangladeshis and cooked with shrimp, dried fish or the head of the ilish fish. Taro is available, either fresh or frozen, in the UK and US in most Asian stores and supermarkets specialising in Bangladeshi or South Asian food. Also, another variety called maan kochu is consumed and is a rich source of vitamins and nutrients. Maan Kochu is made into a paste and fried to prepare a delicious food known as Kochu Bata. In Assam, a north-eastern state of India, taro is known as "kosu" (কচু). Various parts of different types of such plants are eaten by making different dishes. The leaf buds called "Kosu loti" (কচু লতি) are cooked with sour dried fruits called Thekera (থেকেৰা) or sometimes with Tamarind or Elephant apple alone or with a small amount of pulses and sometimes, fish. Similar dishes are prepared from the long root-like structures called Kosu thuri. 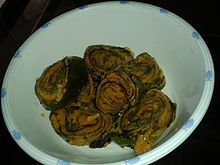 A fried dish with sour objects is also made from its flower (Kosu kala). Soupy dishes are made from solid roots which are sometimes also boiled and eaten sometimes with salt as snacks or home-made fast food. In Manipur, another north-eastern Indian state, taro is known as pan. The kuki tribes called it bal. Boiled bal is a snack at lunch along with chutney or hot chili-flakes besides being cooked as a main dish along with smoked or dried meat, beans, and mustard leaves. They also sun-dry the leaves and keep them for future use as broth and hodge-podge. It is widely available and is eaten in many forms, either baked, boiled, or cooked into a curry with Hilsa fish or with fermented soybeans called Hawai-zaar. The leaves are also used in a special traditional dish called utti, cooked with peas. In Himachal Pradesh, a northern state in India, the taro root is known as ghandyali, and the plant is known as Kachalu in Kangra & Mandi district. The dish called patrodu is made using taro leaves rolled with corn or gram flour and boiled in water. Another dish, pujji is made with mashed leaves and the trunk of the plant and ghandyali or taro roots are prepared as a separate dish. Also in the capital Shimla, a pancake-style dish, called patra or patid, is made using gram flour. A tall-growing variety of taro is extensively used on the western coast of India to make patrode, patrade, or patrada, literally a "leaf-pancake". In the Dakshin Kannada district in the state of Karnataka, it is used as a morning breakfast dish, either made like fritters or steamed. 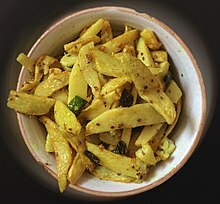 In the state of Maharashtra, the leaves, called alu che paana, are de-veined, rolled with a paste of gram flour, tamarind paste, red chili powder, turmeric, coriander, asafoetida, and salt, and then steamed. These can be eaten whole or cut into pieces, or shallow fried and eaten as a snack known as alu chi wadi. Alu chya panan chi patal bhaji a lentil and colocasia leaves curry, is also popular. In Goan cuisine as well as the Konkani cuisine Taro leaves are very popular. In the Indian states of Gujarat and Maharashtra, the leaves of the plant are used to make patra a dish with gram flour, tamarind and other spices. Sindhis call it kachaloo; they fry it, compress it, and re-fry it to make a dish called tuk which complements Sindhi curry. In Kerala, a state in southern India, taro corms are known as ചേമ്പ് കിഴങ്ങ് chembu-kizhangu. Taro is used as a staple food, as a side dish, or as an ingredient in various side dishes like sambar. As a staple food, it is steamed and eaten with a spicy chutney of green chilies, tamarind, and shallots. The leaves and stems of certain varieties of taro are used as a vegetable in Kerala. In other Indian states, Tamil Nadu and Andhra Pradesh, taro corms are known as sivapan-kizhangu (seppankilangu or cheppankilangu), chamagadda, or in coastal Andhra districts as chaama dumpa in Telugu. It can be cooked in many ways, such as deep-fried in oil for a side item with rice, or cooked in a tangy tamarind sauce with spices, onion, and tomato. In the East Indian state of West Bengal, taro roots are thinly sliced and fried to make chips called kochu bhaja. The stem is used to cook a very tasty Kochur saag with fried hilsha fish head or boiled chhola (chickpea), often eaten as a starter with hot rice. The roots are also made into a paste with spices and eaten with rice. The most popular dish is a spicy curry made with prawn and taro roots. In the Mithilanchal region of Bihar, taro root is known as अडुआ and its leaves are called अड़िकंच के पात. A curry of taro leaves is made with mustard paste and आमिल (sun-dried mango pulp used for a sour taste in daal, curry and sour gravy). In the eastern Indian state of Odisha, taro root is known as saru. Dishes made of taro include saru besara (taro in mustard and garlic paste). It is also an indispensable ingredient in preparing the heart of Odia cuisine, the dalma, where vegetables are cooked with dal. Sliced taro roots, deep fried in oil and mixed with red chili powder and salt, are known as saru chips. In the north Indian state of Uttarakhand and neighboring Nepal, taro is considered a healthy food cooked in a variety of ways. The delicateGaderi taro of Kumaun, especially from the Lobanj region is much sought after. Most commonly it is boiled in tamarind water until tender, then it is diced into cubes which are stir-fried in mustard oil with methi (fenugreek) leaves. Boiling it in salty water in iron cooking pots until it becomes like porridge, is another technique. The young leaves called gaaba, are steamed, then sun-dried and stored for later use. For another use, the taro leaves and stems are used raw as an ingredient for pickles. Crushed leaves and stems are mixed with de-husked urad dal – black lentils and then dried as small balls called badi. The stems may also be sun-dried and stored for later use. On one special day, women worship saptarshi ("seven sages") and eat only rice with taro leaf vegetable. 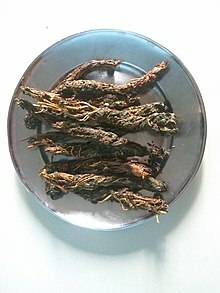 Arikanchan is prepared from taro leaves, black lentils paste and spices in mostely in Eastern Terai of Nepal, is traditional and indigenous food. Taro is grown in the Terai and the hilly regions of Nepal. The root (corm) of taro is known as pindalu (पिँडालु) and petioles with leaves are known as karkalo (कर्कलो) and also as Gava (गाभा). Almost all parts are eaten in different dishes. Boiled corm of Taro is commonly served with salt, spices, and chilies. Taro is a popular dish in the hilly region. Chopped leaves and petioles are mixed with Urad bean flour to make dried balls called maseura (मस्यौरा). Large taro leaves are used as an alternative to an umbrella when unexpected rain occurs. Popular attachment to taro since ancient times is reflected in popular culture, such as in songs and textbooks. Jivan hamro karkala ko pani jastai ho (जीवन हाम्रो कर्कलाको पानी जस्तै हो) means, "Our life is as vulnerable as water stuck in the leaf of taro". 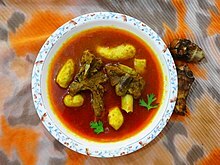 In Pakistan, taro or eddoe or arvi is a very common dish served with or without gravy; a popular dish is arvi gosht, which includes beef, lamb or mutton. The leaves are rolled along with gram flour batter and then fried or steamed to make a dish called Pakora, which is finished by tempering with red chilies and carrom ( ajwain) seeds. Taro or arvi is also cooked with chopped spinach. The dish called Arvi Palak is the second most renowned dish made of Taro. Many varieties are recorded in Sri Lanka, several being edible, others being toxic to humans and therefore not cultivated. Edible varieties (kiri ala, kolakana ala, gahala, and sevel ala) are cultivated for their corms and leaves. Sri Lankans eat corms after boiling them or making them into a curry with coconut milk. The leaves of only one variety, kolakana ala, are eaten. Taro was consumed by the early Romans in much the same way the potato is today. They called this root vegetable colocasia. The Roman cookbook Apicius mentions several methods for preparing taro, including boiling, preparing with sauces, and cooking with meat or fowl. After the fall of the Roman Empire, the use of taro dwindled in Europe. This was largely due to the decline of trade and commerce with Egypt, previously controlled by Rome. When the Spanish and Portuguese sailed to the new world, they brought taro along with them. Recently[ when?] there has been renewed interest in exotic foods and consumption is increasing. In Cyprus, taro has been in use since the time of the Roman Empire. Today it is known as kolokas in Turkish or kolokasi (κολοκάσι) in Greek, which comes from the Ancient Greek name κολοκάσιον (kolokasion) for lotus root. It is usually sauteed with celery and onion with pork or chicken, in a tomato sauce – a vegetarian version is also available. The cormlets are called poulles (sing. poulla), and they are prepared by first being sauteed, followed by decaramelising the vessel with dry red wine and coriander seeds, and finally served with freshly squeezed lemon. In Greece, taro grows on Icaria. Icarians credit taro for saving them from famine during World War II. They boil it until tender and serve it as a salad. In Lebanon, taro is known as kilkass and is grown mainly along the Mediterranean coast. The leaves and stems are not consumed in Lebanon and the variety grown produces round to slightly oblong tubers that vary in size from a tennis ball to a small cantaloupe. Kilkass is a very popular winter dish in Lebanon and is prepared in two ways: kilkass with lentils is a stew flavored with crushed garlic and lemon juice and ’il’as ( Lebanese pronunciation of قلقاس) bi- tahini. Another common method of preparing taro is to boil, peel then slice it into 1 cm (0.39 in) thick slices, before frying and marinating in edible "red" sumac. In northern Lebanon, it is known as a potato with the name borshoushi (el-orse borshushi). It is also prepared as part of a lentil soup with crushed garlic and lemon juice. Also in the north, it is known by the name bouzmet, mainly around Menieh, where it is first peeled, and left to dry in the sun for a couple of days. After that, it is stir-fried in lots of vegetable oil in a casserole until golden brown, then a large amount of wedged, melted onions are added, in addition to water, chickpeas and some seasoning. These are all left to simmer for a few hours, and the result is a stew-like dish. It is considered a hard-to-make delicacy, not only because of the tedious preparation but the consistency and flavour that the taro must reach. The smaller variety of taro is more popular in the north due to its tenderness. In the Azores taro is known as inhame or inhame-coco and is commonly steamed with potatoes, vegetables and meats or fish. It is also consumed as a dessert after first being steamed and peeled, then fried in vegetable oil or lard, and finally sprinkled with sugar. Taro grows in the fertile land of the Azores, as well as in creeks that are fed by mineral springs. Through migration to other countries, the inhame is found in the Azorean diaspora. Taro root is consumed in the south of Spain. Taro has remained popular in the Canary Islands. In the Canary Islands it is known as ñame and is often used in thick vegetable stews, like potaje de berros (cress potage). Taro is called ñame (which normally designates yams) in Canarian Spanish and is a common crop in the Autonomous Community of the Canary Islands (Canary Islands, Spain). Taro ( Turkish: gölevez) is grown in the south coast of Turkey, especially in Mersin, Bozyazı, Anamur and Antalya. It is boiled in a tomato sauce or cooked with meat, beans and chickpeas. It is often used as a substitute for potato. In Kenya, Uganda and Tanzania, taro is commonly known as arrow root, ggobe, or nduma and madhumbe in some local Bantu languages. It is usually boiled and eaten with tea or other beverages, or as the main starch of a meal. It is also cultivated in Malawi, Mozambique, and Zimbabwe. It is known as amadumbe (plural) or idumbe (singular) in the Zulu language of Southern Africa. Taro is consumed as a staple crop in West Africa, particularly in Ghana, Nigeria and Cameroon. It is called cocoyam in Nigeria, Ghana and Anglophone Cameroon, macabo in Francophone Cameroon, and ede in Igbo language. Cocoyam is often boiled, fried, or roasted and eaten with a sauce. 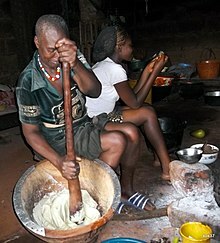 In Ghana, it substitutes for plantain in making fufu when plantains are out of season. It is also cut into small pieces to make a soupy baby food and appetizer called mpotompoto. It is also common in Ghana to find cocoyam chips (deep-fried slices, about 1 mm (0.039 in) thick). Cocoyam leaves, locally called kontomire in Ghana, are a popular vegetable for local sauces such as palaver sauce and egusi/agushi stew. It is also commonly consumed in Guinea and parts of Senegal, as a leaf sauce or as a vegetable side, and is referred to as jaabere in the local Pulaar dialect. In Lusophone countries, inhame (pronounced [ĩ ˈ ȷ̃ɐ̃mi], [ˈ ȷ̃ɐ̃mi] or [ĩˑˈɲɐ̃mi], literally " yam") and cará are the common names for various plants with edible parts of the genera Alocasia, Colocasia (family Araceae) and Dioscorea (family Dioscoreaceae), and its respective starchy edible parts, generally tubers, with the exception of Dioscorea bulbifera, called cará-moela (pronounced [kɐˈɾa muˈɛlɐ], literally, " gizzard yam"), in Brazil and never deemed to be an inhame. Definitions of what constitutes an inhame and a cará vary regionally, but the common understanding in Brazil is that carás are potato-like in shape, while inhames are more oblong. In the "broad" lower class Brazilian Portuguese of the hotter and drier Northeastern region, both inhames and carás are called batata (literally, "potato"). For differentiation, potatoes are called batata-inglesa (literally, "English potato"), a name used in other regions and sociolects to differentiate it from the batata-doce, " sweet potato", ironic names since both were first cultivated by the indigenous peoples of South America, their native continent, and only later introduced in Europe by the colonizers. 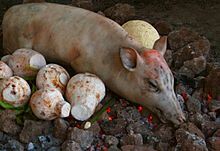 Taros are often prepared like potatoes, eaten boiled, stewed or mashed, generally with salt and sometimes garlic as a condiment, as part of a meal (most often lunch or dinner). In Costa Rica, Nicaragua and Panama, taro is eaten in soups, as a replacement for potatoes, and as chips. It is known locally as malanga (also malanga coco) in Costa Rica, quiquizque in Nicaragua, and as otoe in Panama. In Haiti, it is usually called malanga, or taro. The corm is grated into a paste and deep-fried to make a fritter called Acra. Acra is a very popular street food in Haiti. In Jamaica, taro is known as coco, cocoyam and dasheen. Corms with flesh which is white throughout are referred to as minty-coco. The leaves are also used to make callaloo. In Suriname it is called tayer, taya, pomtayer or pongtaya. The taro root is called aroei by the native Indians and is commonly known as "Chinese tayer". The variety known as eddoe is also called Chinese tayer. It is a popular cultivar among the maroon population in the interior, also because it is not adversely affected by high water levels. The dasheen variety, commonly planted in swamps, is rare, although appreciated for its taste. The closely related Xanthosoma species is the base for the popular Surinamese dish, pom. In Trinidad and Tobago, it is called dasheen. The leaves of the taro plant are used to make the Trinidadian variant of the Caribbean dish known as callaloo (which is made with okra, dasheen/taro leaves, coconut milk or creme and aromatic herbs) and it is also prepared similarly to steamed spinach. The root of the taro plant is often served boiled, accompanied by stewed fish or meat, curried, often with peas and eaten with roti, or in soups. In American Chinatowns, people often use taro in Chinese cuisine, though it is not as popular as in Asian and Pacific nations. Since the late 20th century, taro chips have been available in many supermarkets and natural food stores. In the 1920s, dasheen [nb 1], as it was known, was highly touted by the Secretary of the Florida Department of Agriculture as a valuable crop for growth in muck fields. Fellsmere, Florida, near the east coast, was a farming area deemed perfect for growing dasheen. It was used in place of potatoes and dried to make flour. Dasheen flour was said to make excellent pancakes when mixed with wheat flour. In Venezuela, taro is called ocumo chino or chino and used in soups and sancochos. Soups contain large chunks of several kinds of tubers, including ocumo chino, especially in the eastern part of the country, where West Indian influence is present. It is also used to accompany meats in parrillas (barbecue) or fried cured fish where yuca is not available. Ocumo is an indigenous name; chino means "Chinese", an adjective for produce that is considered exotic. Ocumo without the Chinese denomination is a tuber from the same family, but without taro's inside purplish color. Ocumo is the Venezuelan name for malanga, so ocumo chino means "Chinese malanga". Taro is always prepared boiled. No porridge form is known in the local cuisine. Taro is called dasheen,  in contrast to the smaller variety of corms called eddo, or tanya in the English speaking countries of the West Indies, and is cultivated and consumed as a staple crop in the region. There are differences among the roots mentioned above: taro or dasheen is mostly blue when cooked, tanya is white and very dry, and eddoes are small and very slimy. In the Spanish-speaking countries of the Spanish West Indies taro is called ñame, the Portuguese variant of which (inhame) is used in former Portuguese colonies where taro is still cultivated, including the Azores and Brazil. In Puerto Rico and Cuba, and the Dominican Republic it is sometimes called malanga or yautia. In some countries, such as Trinidad and Tobago, Saint Vincent and the Grenadines, and Dominica, the leaves and stem of the dasheen, or taro, are most often cooked and pureed into a thick liquid called callaloo, which is served as a side dish similar to creamed spinach. Callaloo is sometimes prepared with crab legs, coconut milk, pumpkin, and okra. It is usually served alongside rice or made into a soup along with various other roots. It is also sold as an ornamental aquatic plant. ^ T. K. Lim (3 December 2014). Edible Medicinal and Non Medicinal Plants: Volume 9, Modified Stems, Roots, Bulbs. Springer. pp. 454–460. ISBN 978-94-017-9511-1. ^ "Colocasia esculenta (L. ) Schott". Retrieved 15 February 2015. ^ Umberto Quattrocchi (19 April 2016). CRC World Dictionary of Medicinal and Poisonous Plants: Common Names, Scientific Names, Eponyms, Synonyms, and Etymology. CRC Press. pp. 1060–1061. ISBN 978-1-4822-5064-0. ^ Dastidar, Sayantani Ghosh (December 2009). COLOCASIA ESCULENTA: AN ACCOUNT OF ITS ETHNOBOTANY AND POTENTIALS (PDF). The University of Texas at Austin. Retrieved 25 August 2017. ^ "Colocasia esculenta". Germplasm Resources Information Network (GRIN). Agricultural Research Service (ARS), United States Department of Agriculture (USDA). Retrieved 24 April 2015. ^ "Colocasia esculenta". Germplasm Resources Information Network (GRIN). Agricultural Research Service (ARS), United States Department of Agriculture (USDA). Retrieved 19 February 2015. ^ "Invasive Plants to Watch for in Georgia" (PDF). Georgia Invasive Species Task Force. Retrieved 11 August 2015. ^ Denham, Tim (October 2011). "Early Agriculture and Plant Domestication in New Guinea and Island Southeast Asia". Current Anthropology. 52 (S4): S379–S395. doi: 10.1086/658682. ^ Kreike, C.M. ; Van Eck, H.J. ; Lebot, V. (20 May 2004). "Genetic diversity of taro, Colocasia esculenta (L.) Schott, in Southeast Asia and the Pacific". Theoretical and Applied Genetics. 109 (4): 761–768. doi: 10.1007/s00122-004-1691-z. ^ Lebot, Vincent (2009). Tropical Root and Tuber Crops: Cassava, Sweet Potato, Yams and Aroids. Crop Production Science in Horticulture. 17. CABI. pp. 279–280. ISBN 9781845936211. ^ Chaïr, H.; Traore, R. E.; Duval, M. F.; Rivallan, R.; Mukherjee, A.; Aboagye, L. M.; Van Rensburg, W. J.; Andrianavalona, V.; Pinheiro de Carvalho, M. A. A.; Saborio, F.; Sri Prana, M.; Komolong, B.; Lawac, F.; Lebot, V.; Chiang, Tzen-Yuh (17 June 2016). "Genetic Diversification and Dispersal of Taro (Colocasia esculenta (L.) Schott)". PLOS ONE. 11 (6): e0157712. doi: 10.1371/journal.pone.0157712. PMC 4912093. ^ Matthews, Peter J.; Nguyen, Van Dzu; Tandang, Daniel; Agoo, E. Maribel; Madulid, Domingo A. (2015). "Taxonomy and ethnobotany of Colocasia esculenta and C. formosana (Araceae): implications for the evolution, natural range, and domestication of taro". Aroideana. 38E (1). ^ Matthews, P.J. ; Agoo, E.M.G. ; Tandang, D.N. ; Madulid, D.A. (2012). "Ethnobotany and Ecology of Wild Taro (Colocasia esculenta) in the Philippines: Implications for Domestication and Dispersal". In Spriggs, Matthew; Addison, David; Matthews, Peter J. (eds.). Irrigated Taro (Colocasia esculenta) in the Indo‐Pacific: Biological, Social and Historical Perspectives (PDF). Senri Ethnological Studies (SES). 78. National Museum of Ethnology, Osaka. pp. 307–340. ISBN 9784901906937. ^ a b Barker, Graeme; Lloyd-Smith, Lindsay; Barton, Huw; Cole, Franca; Hunt, Chris; Piper, Philip J.; Rabett, Ryan; Paz, Victor; Szabó, Katherine (2011). "Foraging-farming transitions at the Niah Caves, Sarawak, Borneo" (PDF). Antiquity. 85 (328): 492–509. ^ Balbaligo, Yvette (15 November 2007). "A Brief Note on the 2007 Excavation at Ille Cave, Palawan, the Philippines". Papers from the Institute of Archaeology. 18 (2007): 161. doi: 10.5334/pia.308. ^ Fullagar, Richard; Field, Judith; Denham, Tim; Lentfer, Carol (May 2006). "Early and mid Holocene tool-use and processing of taro (Colocasia esculenta), yam (Dioscorea sp.) and other plants at Kuk Swamp in the highlands of Papua New Guinea". Journal of Archaeological Science. 33 (5): 595–614. doi: 10.1016/j.jas.2005.07.020. ^ Denham, Tim P.; Golson, J.; Hughes, Philip J. (2004). "Reading Early Agriculture at Kuk Swamp, Wahgi Valley, Papua New Guinea: the Archaeological Features (Phases 1–3)". Proceedings of the Prehistoric Society. 70: 259–297. doi: 10.1017/S0079497X00001195. ^ Loy, Thomas H.; Spriggs, Matthew; Wickler, Stephen (1992). "Direct evidence for human use of plants 28,000 years ago: starch residues on stone artefacts from the northern Solomon Islands". Antiquity. 66 (253): 898–912. doi: 10.1017/S0003598X00044811. ^ Barker, Graeme; Hunt, Chris; Carlos, Jane (2011). "Transitions to Farming in Island Southeast Asia: Archaeological, Biomolecular and Palaeoecological Perspectives". In Barker, Grame; Janowski, Monica (eds.). Why cultivate? Anthropological and Archaeological Approaches to Foraging–Farming Transitions in Southeast Asia (PDF). McDonald Institute for Archaeological Research. pp. 61–74. ISBN 9781902937588. ^ Matthews, Peter J. (1995). "Aroids and the Austronesians". Tropics. 4 (2/3): 105–126. doi: 10.3759/tropics.4.105. ^ Barton, Huw (2012). "The reversed fortunes of sago and rice, Oryza sativa, in the rainforests of Sarawak, Borneo" (PDF). Quaternary International. 249: 96–104. doi: 10.1016/j.quaint.2011.03.037. 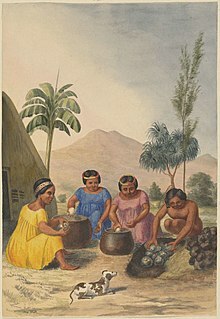 ^ "Ancient Chamorro Agricultural Practices". Guampedia. Retrieved 18 January 2019. ^ Dixon, Boyd; Walker, Samuel; Golabi, Mohammad H.; Manner, Harley (2012). "Two probably latte period agricultural sites in northern Guam: Their plants, soils, and interpretations" (PDF). Micronesica. 42 (1/2): 209–257. ^ The Morton Arboretum Quarterly, Morton Arboretum/University of California, 1965, p. 36. ^ FAO. "Taro Cultivation in Asia and the Pacific". Retrieved 6 June 2016. ^ Taro leaf blight caused by Phytophthora colocasiae, College of Tropical Agriculture and Human Resources (CTAHR), University of Hawai'i at Mānoa, Honolulu, Hawai'i, p. 2. ^ Lilikala Kameʻeleihiwa, Hawaii: Center of the Pacific (Acton, MA: Copley Custom Textbooks, 2008), 57. ^ Lilikala Kameʻeleihiwa, Hawaii: Center of the Pacific (Acton, MA: Copley Custom Textbooks, 2008), 56. ^ Beckwith, Martha Warren. "Papa and Wakea." Hawaiian Mythology. (Honolulu: University of Hawaii, 1976). 94. ^ "A Brief History of Taro in Hawai`i ." Hawaiian kalo. Bishop Museum, n.d. Web. 18 Apr.2013. < http://hbs.bishopmuseum.org/botany/taro/key/HawaiianKalo/Media/Html/history.html>. ^ "Archived copy". Archived from the original on 2012-08-04. Retrieved 2012-02-07. CS1 maint: Archived copy as title ( link), Heard, Barbara H. "HALOA." Lomi Lomi Hawaiian Massage. 2010. Web. 07 Nov. 2011. ^ "Archived copy". Archived from the original on 2012-04-25. Retrieved 2012-02-07. CS1 maint: Archived copy as title ( link), "Taro Creation Story ? Hawaii SEED." Welcome to Hawai'i SEED ? Hawaii SEED. Hawaii Seed, 2011. Web. 07 Nov. 2011. ^ "Taro: Hawaii's Roots". earthfoot.org. Archived from the original on March 3, 2012. ^ Robbins, Joel (1995). "Dispossessing the Spirits: Christian Transformations of Desire and Ecology among the Urapmin of Papua New Guinea quick view". Ethnology. 34 (3): 212–213. ^ "Real Estate Guide Plano – Hottest Deals On Market". Real Estate Guide Plano. Archived from the original on 2011-09-13. ^ "How to Make Coconut and Taro Ice Cream – A Thai Classic Dessert". Pinterest. 18 March 2013. ^ "Kochu! (You can say that again...)". The Daily Star. 2016-07-26. Retrieved 2017-12-16. ^ The Cross Name Index to Medicinal Plants, Four-Volume Set By Anthony R. Torkelson. Page Number 1694. ^ "Ei leh in lam bawk aw! - mi(sual).com". www.misual.com. ^ "Humayunpur: A Mini North-Eastern Food Hub In Safdarjung". ^ Romero-Frias, Xavier. "Eating on the Islands". HIMĀL Southasian. 26 (2): 69–91. ^ "Colcasia قلقاس". egyptian-cuisine-recipes.com. Retrieved 2018-10-19. ^ "Potaje de Berros". culturatradicionalgc.org. Retrieved 2018-10-19. ^ a b Robert A. Young. "The Dasheen: A Root Crop for the Southern States." Circular 127-C. U.S. Department of Agriculture, Bureau of Plant Industry, 17 May 1913. p. 26. ^ "The dasheen: a tropical root crop for the South / [by W.H. Hodge]". HathiTrust Digital Library. Washington, D.C. : U.S. Dept. of Agriculture, 1954. Retrieved 15 February 2016. ^ Hughes, Nicole M; Carpenter, Kaylyn L; Keidel, Timothy S; Miller, Charlene N; Waters, Matthew N; Smith, William K (2014). "Photosynthetic costs and benefits of abaxial versus adaxial anthocyanins in Colocasia esculenta 'Mojito'". Planta. 240 (5): 971–981. doi: 10.1007/s00425-014-2090-6. Colocasia esculenta in West African plants – A Photo Guide.